Reposted with permission from constructionexec.com, November 6, 2018, all rights reserved. Copyright 2018. Nearly a month out from Hurricane Michael’s landfall, residents and businesses in the Florida panhandle are still immersed in cleanup, awaiting insurance appraisals and doing everything possible to keep employees on the payroll. While much of the focus has been on Bay County communities such as Mexico Beach and Panama City, which experienced a record 20-foot storm surge, devastation also abounds to the north due to wind damage and tornados. Hurricane Michael caused at least 35 deaths, destroyed 85 miles of transmission lines, and is responsible for billions of dollars in agricultural and timber losses across Florida, Alabama and Georgia. Schools across several counties were badly damaged and remain in need of repairs. Jails are in bad shape as well, including one in Marianna that reportedly was hit by five tornados. Hospitals and county administrative offices have power, but essentially are limping along. In Gulf County alone, more than 1,145 homes were completely destroyed and another 1,825 sustained major damage. Many residents are still waiting on insurance adjusters to show up. Keith Lawson Company, Inc. suffered a total loss of its Panama City office, which employs about 35 people doing commercial HVAC and plumbing work. After a week off after the storm to deal with personal property damage, everyone returned to a temporary office—still without power—to help get mechanical equipment in Bay County schools back up and running. Staff from the firm’s Phoenix City, Alabama, and Tallahassee, Florida, offices supplemented local crews to deal with cleanup and repairs. FEMA is in place and doing its part to give families a little bit of financial relief, but the only thing companies have access to is a small business loan. Essentially some firms are in the position of having to pay their employees to keep them on board, but they aren’t up and running so they aren’t bringing in any money. “A handful of our members with offices in Panama City have had to rent modular buildings to operate. And they’re trying to find their employees housing so they can get a paycheck and don’t leave the company,” Brooke says. 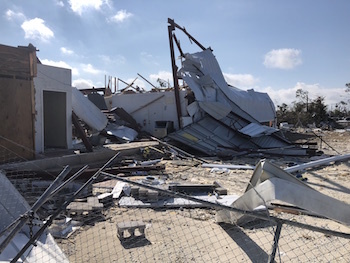 Two Keith Lawson Company employees rendered homeless by the hurricane were transferred to the company’s Tallahassee office; everyone else is back on the job in Panama City, including about 10 new skilled laborers whose prior employers were no longer operational. Coming off a disaster of this magnitude with no job losses is an impressive feat considering the construction industry’s existing workforce shortages and that FEMA is offering people $15/hour salaries. In the meantime, a long road lies ahead for the region called “the forgotten coast.” The moniker is intentional: They don’t want to be the next Disney World or have high-rises like Destin, Florida. But the downside is the prevalence of older structures that were built long before updated building codes took effect—and therefore suffered substantially from flooding and wind damage. Once the cleanup phase is over, homes and businesses will be rebuilt to a more strenuous code. Additionally, more schools may be upgraded to serve as higher-rated shelters for strong hurricanes like Michael. After Hurricane Michael blew through the Florida panhandle last month, and then onto Georgia and Virginia, GrayRobinson (a member of Associated Builders of Contractors of Florida) helped organize a semi-truck full of donations and drove it from Orlando to Tallahassee and then to Port St. Joe in Gulf County. “We were invited to meet with county officials and see the need,” says Angie Brooke, president of the ABC North Florida Chapter. Since then, local ABC members partnered with two churches to send another U-Haul truck of supplies to a small community in Altha, Florida. “In the beginning, it was all about preserving life with generators, water and food. Now, they need building supplies; it’s about coordinating efforts to actually rebuild,” Brooke says. One construction company has offered to donate plywood, but it’s waiting on the go-ahead from county officials so it’s clear exactly what is required and where it should be sent.